Valentines Day is the time of year when it is easiest to get up the courage to tell someone you love them. Rather than just buying a Valentine's Day card from a shop, here is a love heart that you can make yourself to give as a special gift - and you can add a little extra oomph to it with some magic. When you are choosing what fabric to use, you could buy new material or you could reuse something, perhaps from a beautiful dress that you love but has seen better days. Not only would it be environmentally friendly to recycle a garment in this way, it would also add to the magic because the material would have a very personal connection to attract your intended Valentine to you. Cut out two heart shapes from the fabric, slightly larger than you want the final love heart to be. Then, place the two hearts with the right sides of the fabric facing each other and stitch a seam around the edges, leaving a small bit unstitched at the indented bit at the top of the heart (where the ribbon to hang it from will go). Turn the heart right side out by pulling the fabric through the unstitched bit. Stuff the heart with a mixture of the lavender, cinnamon, vanilla and (optionally) a little frankincense. These herbs and spices are not only magically associated with love spells, but are also scents that people - especially men - find attractive. Fold the ribbon in two and poke the ends into the unstitched bit of the heart to form a loop, then sew the ribbon in place and complete the seam with neat stitches to keep everything in place. Finally, decorate the heart as you desire. You could attach ribbons or buttons or embroider "Be My Valentine" on the front. That (X) should be my Valentine"
It is best if you cast this spell on a Friday, which is sacred to Venus, Goddess of Love. If you don't feel confident enough to make your own love heart, you could cast the spell with one you bought in a shop. I have to admit that the photo doesn't show my own work. 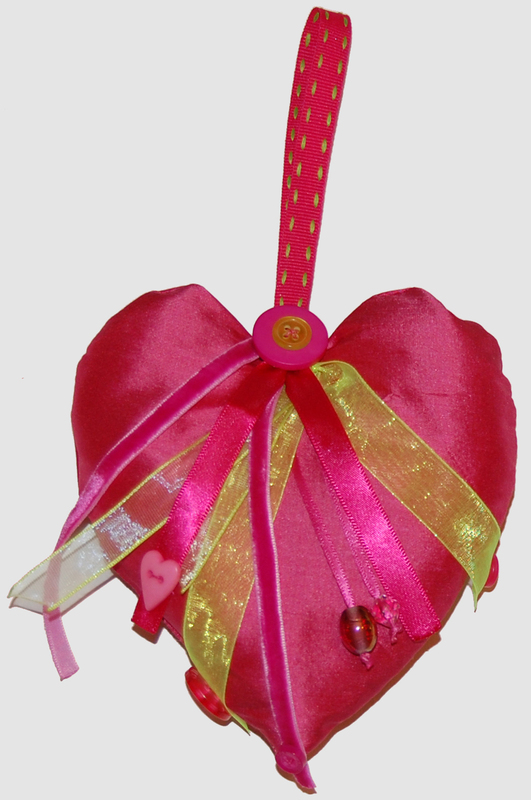 It is a silk lavender heart which is available at The Vintage and Handmade Gift Co. I did have a go at making a love heart, but it didn't look as good as the one in the picture. I've used the image with permission, but have been asked to state the PR bit: "Add a bit of luxury with this beautiful handmade heart made of a pink, pure silk and embellished with ribbons, beads and buttons." It is stuffed with lavender, measures 5 inches across and costs £9.95.